In June 2015, Elon Musk, CEO and CTO of SpaceX and CEO and product architect of Tesla Motors, issued a challenge. He established an open competition geared towards university students and independent engineering teams to design and build the best Hyperloop pod. 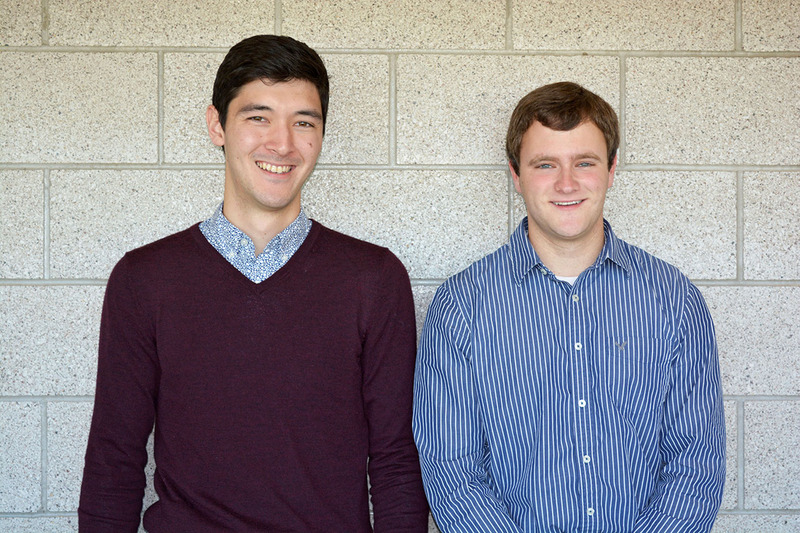 Andrew Kitahara, a senior in materials engineering, and Brandon Klosterman, a senior in mechanical engineering, are leading a group of 50 College of Engineering students who are taking on SpaceX and Musk’s Hyperloop challenge. The Hyperloop is Musk’s concept for a high-speed rail used in transport for humans and cargo. It was Musk’s response to the news that California was building a $68 billion high-speed rail system with a top speed of 220 mph. Musk said this project would be too expensive and the finished product would be too slow and inconvenient. He proposed the Hyperloop that in theory would move at 700 mph and could shuttle passengers from San Francisco to Los Angeles in 30 minutes for a $20 one-way ticket. Klosterman briefs the team on the latest updates. 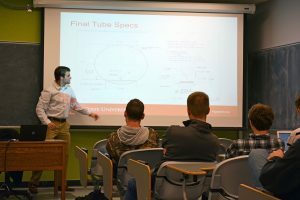 The goal of the Hyperloop pod competition is to spur the development of a functional prototype and encourage student innovation. Teams will design and build a half-scale Hyperloop pod as well as submit designs for subsystems, pod safety features, design details, and a cost breakdown. In January 2016, teams will head to Texas A&M University to present the Pod designs and get feedback from SpaceX officials, Tesla engineers, and university professors. Those teams that make it past design weekend will then head to SpaceX headquarters in Hawthorne, CA to operate their pods on a sub-scale test track adjacent to headquarters. Kitahara and Klosterman met a few years ago during a study abroad in Italy, but it was after a chance meeting this summer that the duo decided to put a team together. Kitahara said he was motivated to pursue this project after reading about it in the news over the summer. He decided to take on the challenge before he even had an idea or a team together, figuring he could generate enough interest in the project that students would want to get involved once everyone was back on campus. He gave his pitch to Klosterman during their meeting on a subway platform and after researching it for a few days, Klosterman was all in, and the team began to take shape. Kitahara said one of their goals was to create as diverse of a team as possible, with students from across the College of Engineering and the university coming together to show what Iowa State students can do. Currently, the duo have put together a multidisciplinary team composed of students in aerospace engineering, electrical engineering, mechanical engineering, materials engineering, industrial engineering, computer engineering, as well as a couple computer science students. In August, SpaceX released the general guidelines of what teams will need to do to compete. The Iowa State team is currently working on meeting the first deadline to submit a top-level design. There are six different subsystems the team wants to work on, so the entire 50 person team is broken up into six smaller groups each focusing on one subsystem. Each small team has a team captain who leads the group and reports back to Kitahara and Klosterman in a weekly meeting. With six different groups, KItahara said one of the biggest challenges is maintaining contact with everyone and making sure that the whole team is on the same page in terms of the end goal. Kitahara and Klosterman said that the scale of the project and the technical challenges that lie ahead also seem daunting. “Everything involved in this project is going to be very in-depth and very demanding,” said Klosterman. Both students predict that their experiences in the classroom and in the lab will help them overcome these challenges. On the mechanical side, Klosterman expects structures for mechanical aspects to play a huge role, so the mechanicals and materials class and the machine design classes where students conduct frequency analyses will be extremely important. When it comes to materials, Kitahara sees multiple avenues for classroom and lab experiences to come into play for everything from metal alloys to use or a certain ceramic material that will be good for heat shielding. With all the challenges and benchmarks to meet, both Klosterman and Kitahara are optimistic about what this project has in store for the team and for themselves. Being the leader of operations has pushed Klosterman out of his comfort zone, something he expects will help him grow both personally and professionally. He hopes to help out the team as much as possible when it comes to design and manufacturing for assembly. Kitahara sees this project as the ultimate culmination of his work at Iowa State. Kitahara said that when he heard about the project, he felt he had enough experience and confidence to go out and give the competition his best shot.